Many of the world’s greatest breakthroughs have something in common – strong intellectual property (IP) protection provided by the United States Patent and Trademark Office (USPTO). In fact, IP protection was included in Article I, Section 8 of the Constitution by our Founding Fathers, who deemed it essential for society “to promote the progress of science and the useful arts securing for limited times to authors and inventors the exclusive right to their respective writings and discoveries.” Since Thomas Jefferson— the first patent examiner— reviewed the first U.S. patent, the country has been transformed by ingenuity to become the most open economy in the world where global businesses come to work and innovate on the cutting edge. The Leahy-Smith America Invents Act of 2011 enables the USPTO to grant patents and trademarks faster and with greater quality and clarity, further strengthening our country’s IP system. The USPTO offers countless resources, including the Track One Prioritized Examination Program for accelerated examination, and the Pro Bono and Pro Se programs, which provide free legal representation and support services for small and independent inventors. The USPTO continually strives to keep costs and fees low. For a brief overview on the steps necessary to obtain a patent you can refer to our Commerce blog, Five Steps for Protecting your Invention and for a trademark, Six Steps to Protect your Brand. At any time you can receive USPTO assistance by contacting the Inventors Assistance Center. The USPTO is also very active internationally, working to protect U.S. interests abroad through the IP Attaché Program and collaborating with international IP organizations toward international patent harmonization. For all these reasons the U.S. intellectual property system has long made America an attractive place to innovate and invest. Companies from around the world leverage the power of the U.S. patent, while supporting the U.S. economy. The strength of the intellectual property environment is an indicator of market potential for inventors and companies to develop their technologies, grow their businesses, and expand sales of their products. That is why we would like to encourage you to attend the SelectUSA Investment Summit in the Washington, DC area on March 23-24, 2015. Investors will find the practical tools, information, and connections they need to establish or expand operations in the United States. SelectUSA was created to work across the U.S. government to attract and retain business investment in the United States in order to create jobs, spur economic growth, and promote U.S. competitiveness. Those who choose to invest in the United States can feel secure knowing that there’s a long tradition of protecting valuable intellectual property. The United States Patent and Trademark Office hosted its annual Intellectual Property (IP) Attaché consultations at its Alexandria, Va. headquarters during the week of December 15. Each year since 2007, participants from the USPTO and other government agencies, organizations, associations, and universities attend the event to exchange information about international IP issues and the work of USPTO’s IP attachés. The consultations provide a platform for all 11 IP attachés to share their accomplishments, participate in briefings on patent, trademark, and copyright developments in the United States, and collaborate with other organizations, stakeholders, and foreign IP attachés. The consultations enable information exchange and coordination with U.S. stakeholders, with a goal of improving IP protection and enforcement abroad. 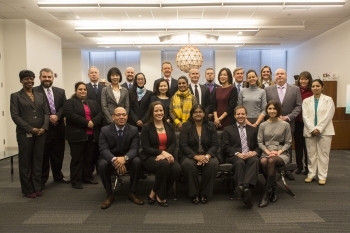 The USPTO IP Attaché Program assigns experts to U.S. embassies or consulates overseas to represent the USPTO and advocate U.S. government policy positions on IP. IP attachés have assisted many industry associations, businesses, and other U.S. stakeholders in their efforts to protect and enforce their IP rights and navigate local IP laws in regions around the world. Each IP attaché has expertise in the fields of international IP law, policy and enforcement. In the week prior to the Alexandria meetings IP attachés met with the public in San Francisco and San Jose, including representatives from high tech organizations, legal associations, and universities. These consultations provided education and built contacts with a broad range of organizations interested in learning more about the IP Attaché Program and U.S. government IP policy overseas. The consultations also included a half-day discussion sponsored by the U.S. Chamber of Commerce, where IP attachés exchanged views with chamber members and the public on various international IP issues. The discussion centered on ensuring that IP systems help protect U.S. interests abroad while reducing trade barriers and encouraging strong economic growth. During a career roundtable webcast, USPTO employees discussed potential career opportunities with the public and explained what it is like to work as an IP attaché. Participants asked questions and heard first-hand some of the accomplishments and challenges faced by IP attachés while on assignment. If you missed this roundtable, you can view the webcast on the U.S. Chamber of Commerce website. The USPTO extends its gratitude to all those who participated in the IP attaché consultations and to those who contributed to making the event a productive exchange of information, helping to reinforce a strong and effective IP system worldwide. Visit the IP Attaché Program on the USPTO website to learn more about it.